It’s an exciting day when your new artwork arrives. 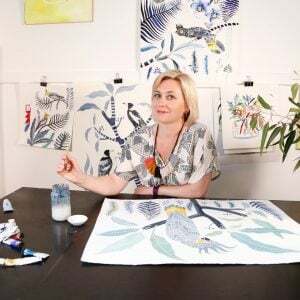 Carefully opening the cardboard, slowly peeling back the bubble wrap and revealing the masterpiece within – there’s something very special about bringing a carefully crafted artwork into your home. But things get tough when it’s time to find your new piece its forever home on your wall. 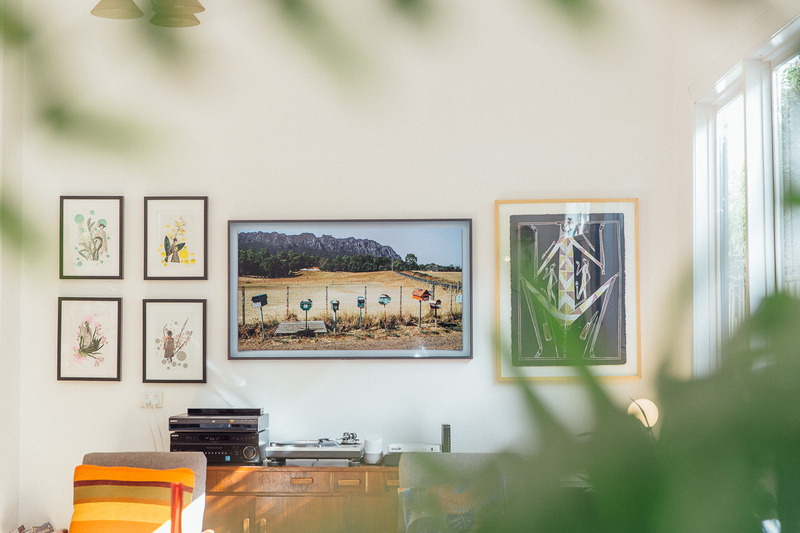 We’ve previously revealed our top tips for how to hang a picture, but what happens when you’ve already got more than a few artworks on the walls (like all of the Bluethumb team)? 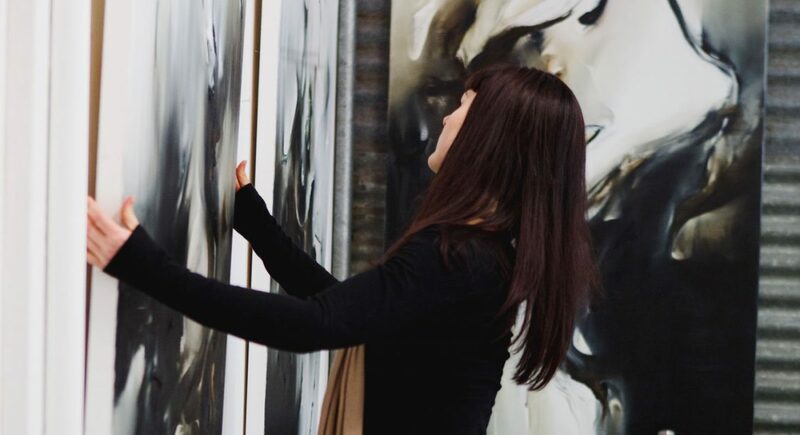 Hanging art can be a daunting task. 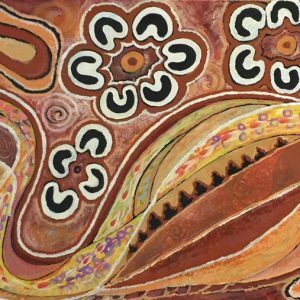 While an artwork on its own can make a strong statement, it can be hard to balance the variety of sizes, colours and shapes with a collection of pieces. 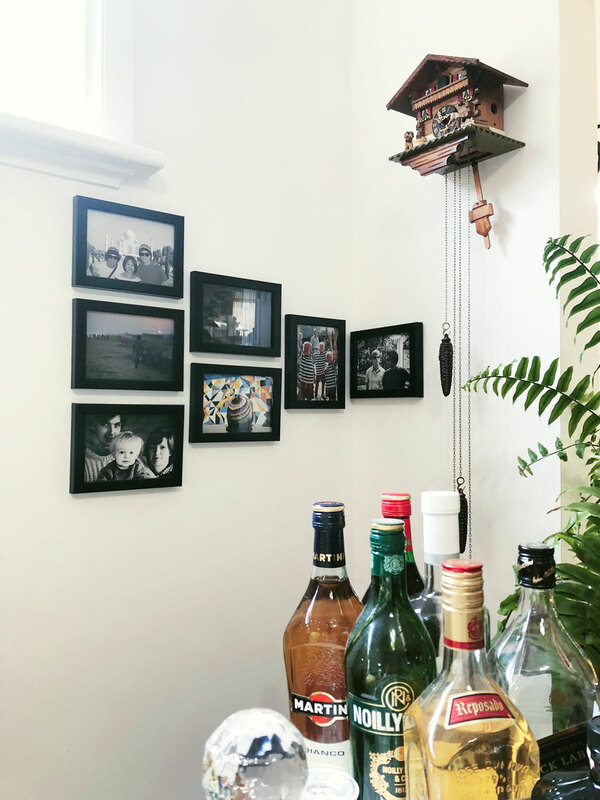 Don’t despair, hanging your collection is simple with these 5 gallery wall looks you can easily recreate in your own home. 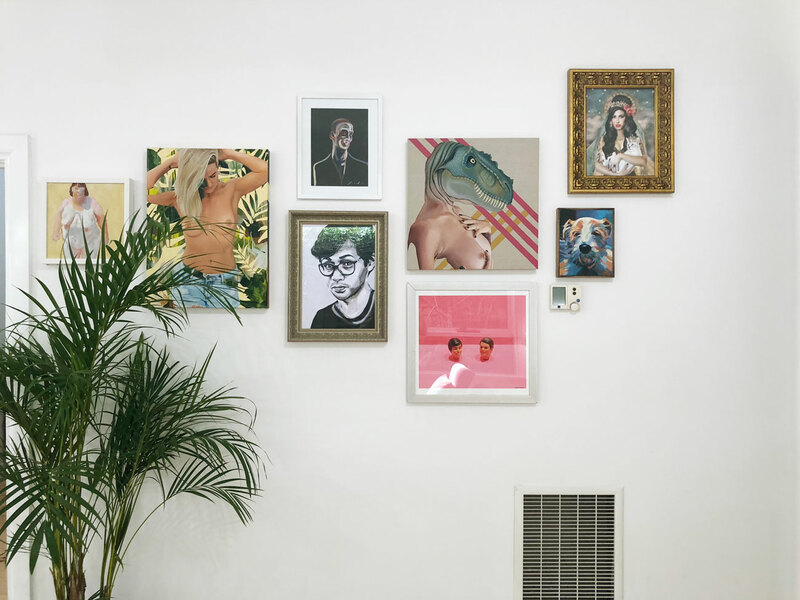 Why hang a single, lonely artwork when you can group it with others for a full wall of artworks? There are so many options for creating a salon style hang. This method of grouping artworks is best created by simply following your heart and finding asymmetrical balance. The best part? With it’s jagged edges, it’s easy to keep adding more pieces over time! To keep this hang from feeling messy or mismatched, it’s important to keep the look cohesive. 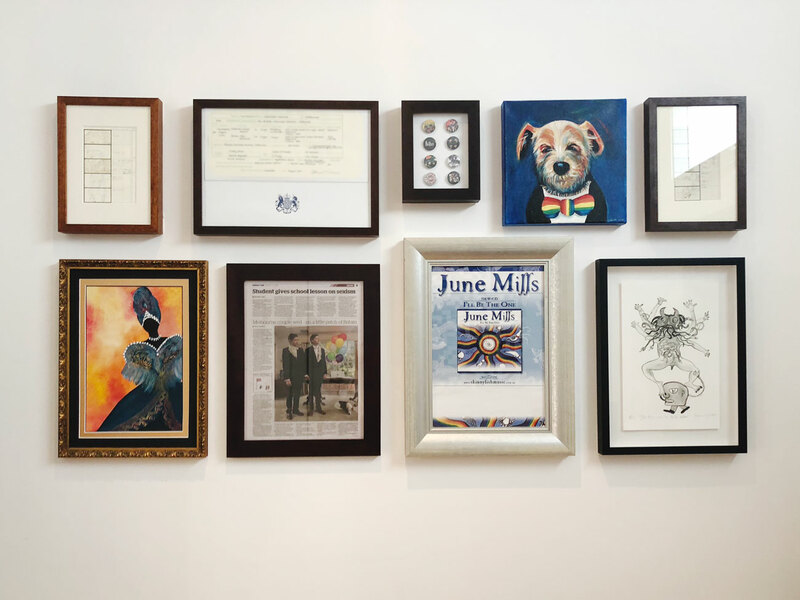 You can go for an eclectic collection of works in matching frames, or choose an artwork theme – like our PR Manager Freddy did with his portrait wall. Freddy’s gallery wall features portraits from many of Bluethumb’s artists, including Kim Leutwyler, Jemma Cakebread, Rosemary Whatmuff and Loribelle Spirovski. You can pick your art theme by colour palette, style, subject matter or even just having artworks by one artist. For a cohesive look, it’s important that all the artworks have something in common – even if it’s just the same style frame! As you can see above, with Freddy’s selection of portrait art, he’s chosen a variety of different frames, designed to complement each individual artwork. It works, since all the artworks are from the same category and the artworks next to each other have matching hues. Not sure how to choose the right frame? Read our tips on finding the perfect frame. 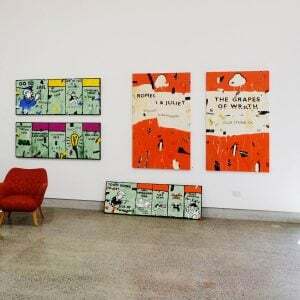 It’s no secret that Freddy is one of Bluethumb’s best customers, so with his large collection of art comes a variety of different hanging styles. 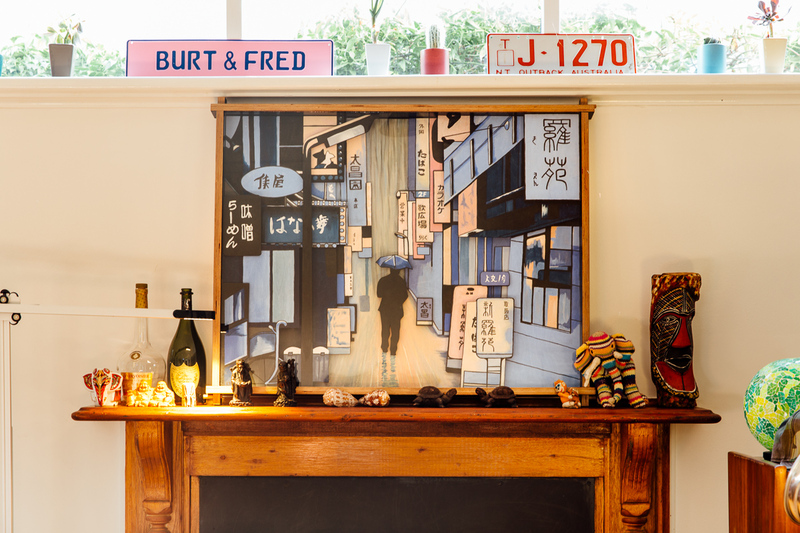 In another room in his mid century home, Freddy has done another gallery style hang – but this time it has boundaries and lines up. In his home office, Freddy has hung several different artworks in a clever way to form a rectangle. The great thing about this style of hang is that it can make otherwise mismatching pieces look cohesive and meant to be together. 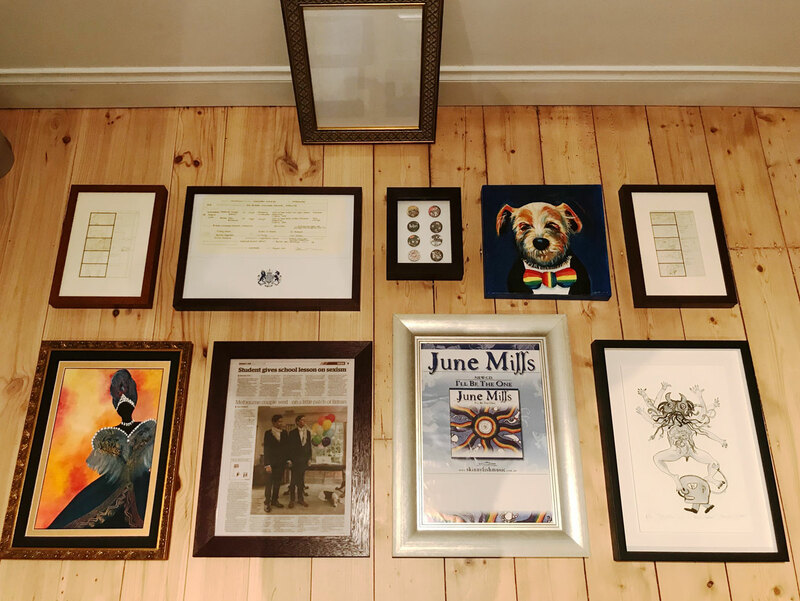 Freddy’s rectangular hang features a portrait of his dog Grungle as well as album covers, news articles and memorabilia. Mapping out this style of hang is no easy feat – as you can guess, it took hours of planning. To make sure the overall effect was balanced and visually appealing, Freddy laid out the artworks on his floor before hanging them (note: this is also a great tip for the salon style above). Planning a hang this way means that you can try all sorts of combinations before settling on the final hang. Planning the hang took Freddy a few tries at different combinations on his floor before he decided on the perfect arrangement. Who says artwork has to go on a wall? A shelf is the perfect solution when your artwork is too small or heavy for a wall. For added fun, you can also add fun and quirky knick knacks and plants to bring out the colours of your new piece. 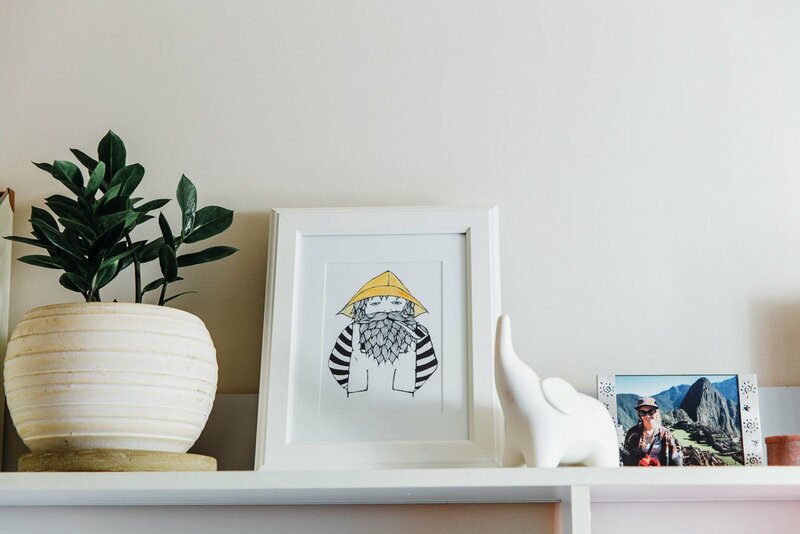 Our Content & Community Coordinator Megan’s #shelfie features a pop of yellow from a sailor print by Tina Mose. 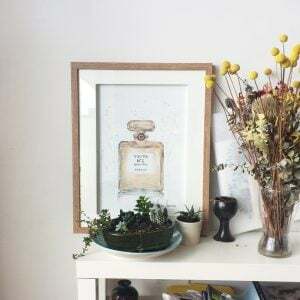 Using a sturdy shelf is also a great hack for when your walls aren’t strong enough for your heavy artwork. In this case, you can simply lean the artwork against the wall, and the shelf will take the weight. Still be careful to make sure the artwork is secure either with hanging strips or a hook. Freddy’s fireplace is the perfect spot for this heavy 3D Erin Nicholls piece. A corner may not be the first place that springs to mind when hanging artworks, but that doesn’t mean you should rule it out. 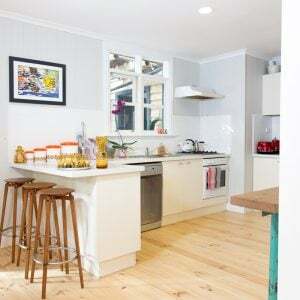 With some creative hanging, you can turn the unloved nooks and crannies of your home into a feature. Get creative and try something a bit different. Embrace corners by making them a focal point. The most simple way to hang multiple artworks, especially when they’re all quite large, is to create a sense of symmetry and balance. You don’t want the wall to look overloaded and heavy on one side, so it’s important to consider the size of the artworks you’re hanging. Freddy’s TV is nestled between a set of Karen Coull collages and an Aboriginal artwork from Readback Gallery in Darwin. Above Freddy has arranged the four smaller collage pieces to be a similar size to the single large artwork on the other side of the TV (Samsung’s The Frame TV disguises itself as an artwork). Notice how symmetrical it looks? For more art inspiration from our collectors, check out our Buyers Wall. Thank you for such a helpful guide. I have a question … I purchased 3x propaganda prints in Vietnam a few years ago and I have hung them in separate places to allow them to shine individually. Reading your guide to hanging, I am wondering whether I could include other original paintings with them? Your comments would be awesome. BTW I am an amateur painter. You could definitely include other original paintings with your propaganda prints. We recommend making sure all the works have something in common – whether it be size, colour, style or frames! 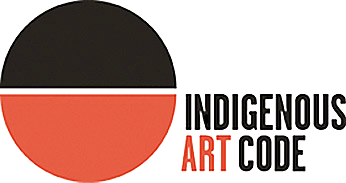 If you want help finding some originals to match, just email [email protected] and our curatorial team will be in touch.